WHERE CAN YOU FLY TO FROM UK AIRPORTS? If looking out the window has you wishing you were elsewhere, you're in luck, as we've rounded up the best holiday destinations to fly to from the UK – so there's really no excuse. Discover the most popular regions to visit from your closest UK airport and book a 2018 holiday with our fantastic beach and city break deals – you'll be swapping your briefcase for a beach bag in no time! These airports whisk you to more than 350 destinations across the world, including the Balearics, Canary Islands, Spain, Greece, Algarve, Dubai, Marrakech, New York and Orlando. The most centrally located, Heathrow is just 23km west of central London and ideal if you're looking for long haul flights. Gatwick, located 45km south of London, is the world’s most efficient single-runway airport. If you prefer cheap flights to short haul destinations, choose from Luton, Stansted and Southend, the latter two located in Essex. All London airports are well-connected by bus, coaches, train, car and taxi. Heathrow is accessed by the Underground metro (Piccadilly Line) as well. 1. Tenerife (Flight time: 4h 30mins from London Gatwick): Golden beaches, exhilarating watersports, family-friendly resorts and colourful villages – the largest of the Canary Islands has myriad charms to show. For nature lovers, there’s Mount Teide, the world’s the third largest volcano. 2. Heraklion (Flight time: 4h 15mins from London Stansted): If you aren’t mesmerised enough by the picturesque beaches, Heraklion boasts a bustling harbour, quaint old town, ancient ruins and vibrant nightlife. 3. Dubai (Flight time: 8 hours from London Heathrow): The city of superlatives has everything larger than life – sweeping golden beaches, towering skyscrapers, super-sized shopping malls, amazing theme parks, buzzing souks and glitzy nightlife. And yes, how can we forget the adrenaline rush a desert safari gives? • All London airports offer short stay, long stay, valet and blue-badge disabled parking facilities. You can also pre-book your parking space. • There are mobility scooters, assistance dogs, eagle hoists, reserved seating and a number of other services for disabled travellers and those with hidden disabilities. • All the airports house executive lounges, which offer complimentary snacks, drinks, Wi-Fi, newspapers, TV and lots more. • There’s an endless variety of restaurants, cafes and bars as well as duty-free shops stocking some of the world’s best brands. In fact, Heathrow might make you feel like you’ve entered a bustling shopping mall! • Fast Track security can be availed by departing, arriving and connecting passengers. • You’ll find plenty of cash machines and currency exchange desks at all the airports. The third busiest of the UK airports is Manchester Airport, which connects to almost 200 destinations around the world. Whether you fancy a splash-tastic summer getaway in the Canaries or want to jet away to Corfu, Antalya or Costa Blanca for winter sun holidays, you'll find a flight that suits you in Manchester. Located around 14km southwest of Manchester’s city centre, the airport is well-accessible by train from the heart of the city, as well as nearby cities like Liverpool, Leeds, Edinburgh, Glasgow and Birmingham. Catch a train from Manchester Piccadilly station and you can reach the airport in just 20 minutes. Manchester airport is also connected by Metrolink tram services, bus, coaches, taxi and car. 1. Antalya (Flight time: 4h 45mins): Nicknamed The Turkish Riviera, Antalya comes with a long coastline that offers postcard-perfect beaches and quaint coves – perfect for lounging all day. But if you want hustle and bustle, hit Lara – the Las Vegas of Turkey. 2. Costa Blanca (Flight time: 2h 50mins): The first thing you’ll love about Costa Blanca is its sugar-white sweeping beaches running along the 218km-long coastline. If that’s not enough, you have sizzling nightlife, kid-friendly attractions and loads of Spanish charm. 3. Corfu (Flight time: 3h 30mins): If you want to lounge on idyllic beaches surrounded by rugged cliffs and olive groves, savour authentic Greek delicacies in a traditional taverna or wander around cobbled streets in the old town, Corfu won’t disappoint you. • The executive lounges, present in all 3 terminals of the airport, offer you a range of amenities, including buffet food, alcoholic and non-alcoholic drinks, free Wi-Fi and charging points. You can pre-book the lounges from just £19 per person. • Parking options include short stay, long stay, valet and budget parking. You can also park your car right next to the terminal. Fares start at around £40. • Manchester Airport offers Fast Track lanes for security check and passport control. You can pre-book the passes, starting from £5 per person. • While you await your flight, browse the duty-free shops and retail brand stores. The collect-on-return policy lets you pick up your stuff on return from your trip. • Looking for a place to dine and drink? Choose from Burger King, Starbucks, Upper Crust, Café Nero and lots more. • In case of any flight delay, there are a number of hotels close to the airport, including Radisson Blu, Hilton and Crowne Plaza. Explore cultural Barcelona or top up your tan on the family-friendly beaches of Majorca, Costa Blanca, Algarve and Canaries – you can fly away to more than 150 direct destinations from Birmingham Airport. Just 9km from the Birmingham city centre, the airport is accessible by car, taxi, bus, coaches and train. Birmingham International Station, the nearest railway station, is directly connected to over 100 UK towns and cities. You can also opt for the free 'Air-Rail Link' monorail system. Buses have access to the airport terminal and the Birmingham International Station. If you want to drive down, Birmingham Airport is at the centre of the UK Motorway network, accessible via the M42 motorway. 1. Dalaman (Flight time: 4h 40mins): Sun-kissed Dalaman is a true beach lovers' paradise. Unwind on the world-famous Olu Deniz beach, snorkel in the turquoise waters of the Aegean Sea or relish Turkish delights like baklava – the choice is yours! 2. Fuerteventura (Flight time: 4h 20mins): Popularly known as the beach capital of the Canaries, Fuerteventura offers more than 150 exotic beaches and loads of fun-filled watersports. Don’t forget to try delectable Canarian cuisine while you're here too - patatas bravas is a popular bite. 3. Barcelona (Flight time: 2h 20mins): When you’re not exploring iconic sights like Sagrada Familia Cathedral and Park Guell, you’re either shopping at the bustling La Ramblas or embarking on a tapas trip – Barcelona is your perfect weekend city break. • Depending on your duration, the airport offers on-site and off-site parking facilities. There are surface and multi-storey car parks, motorbike parking and valet parking. Prices start around £45. • There are 3 executive lounges at the airport offering free Wi-Fi, food and drink, charging facilities and quiet zones. • If you’re pressed for time, opt for the Express Lane security check, which can be pre-booked online for £3.75. On arrival, the Premium Fast Track service (£5 per person) helps you skip long queues. • The airport provides special assistance such as disabled parking and electric mobility scooters for travellers with reduced mobility. • Indulge in retailtherapy at the airport stores, which include Boots, Superdry, Victoria’s Secret, WHSmith, World Duty Free and Accessorize. • While you’re shopping, your little ones can let off steam at the Sky Zone interactive play areas. If you’re living in southwest England and South Wales, Bristol Airport is the perfect springboard to jet away to more than 125 destinations, including Majorca, Lanzarote, Dalaman, Costa del Sol, Tenerife, Prague and Paris. The airport is located at Lulsgate Bottom in North Somerset, 13km from Bristol's bustling city centre. It's well-accessible by car and the Airport Flyer bus service, which connects Bristol Airport with Bristol Temple Meads train station and Bristol Bus & Coach Station in the city centre - equally a convenient way to reach the airport. There are also regular bus and coach services from nearby areas, including Bath, Cardiff, Plymouth and Exeter. 1. Lanzarote (Flight time: 4h 10mins): The spectacular black sandy beaches and the lunar-like volcanic landscape gives Lanzarote a unique charm. With a plethora of water activities such as surfing, kiteboarding and windsurfing on over 90 beaches, Lanzarote is pure bliss! 2. Algarve (Flight time: 2h 50mins): Endless golden-sand beaches framed by dramatic orange cliffs, pristine whitewashed villages, luxury family-friendly resorts, exciting watersports, vibrant beach bars and thumping nightlife – need we say more? 3. Costa del Sol (Flight time: 2h 50mins): Costa del Sol is all about sun, sea and sand. The powder-soft beaches are great for watersports, while the nearby resorts of Benalmadena and Fuengirola offer family fun for all ages. After sundown, head to Marbella for a lively night scene. • Make the most of your time by browsing the airports retail stores, which include Accessorize, Claire’s, Dixons Travel and WHSmith. • For hunger pangs, head to the eating area that houses Starbucks, Burger King, Brunel Bar & Kitchen, Dexters and more. • Two executive lounges – Aspire and AspirePlus – provides complimentary drinks, snacks, Wi-Fi, newspapers and magazines. Charges start from £20.99. • Bristol Airport offers a selection of passenger amenities such as Fast Track security lanes, 3 currency exchange bureaus, free Wi-Fi for up to 2 hours, porter service and special assistance for travellers with disability. • If you’re looking for an overnight stay, Hampton by Hilton – 250 metres from the terminal – is an ideal option. Whisking away almost 10 million travellers every year to over 100 destinations, including favourites Canaries, Majorca, Antalya, Greek Islands, Amsterdam and Cancun, Glasgow Airport is the perfect base if you reside in the west of Scotland. Located just off the M8 motorway and around 16km from the city centre, Glasgow is the only airport in Scotland with direct motorway access to Glasgow city centre and other locations in Scotland. There are regular buses connecting the airport from Buchanan Bus Station in the city centre, including the Glasgow Airport Express which reaches the airport in just 15 minutes. The closest station to the airport is Paisley Gilmour Street, around 1.5km from the terminal. 1. Gran Canaria (Flight time: 5 hours): A safe bet for summer holidays with kids or a romantic winter sun getaway, Gran Canaria is all about rolling golden beaches, spectacular coastal resorts, camel ride in the dunes, catamaran cruises and thriving nightlife. 2. 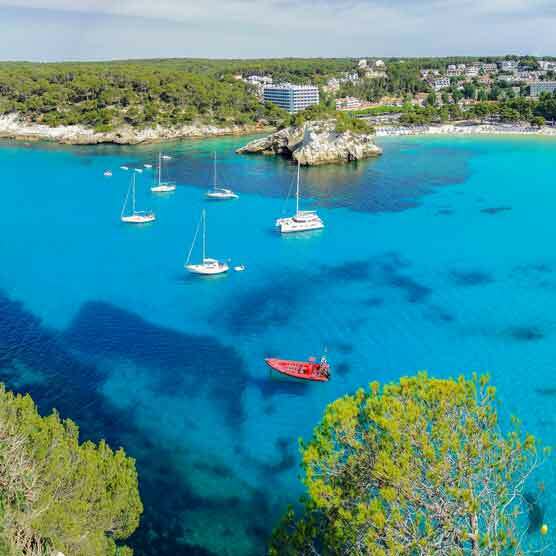 Majorca (Flight time: 3h 5mins): The biggest of the Balearic Islands, Majorca appeals to everyone with balmy Med sunshine, stunning beaches and a dash of culture. For fun in the evening, hit the sizzling bars and nightclubs of the neighbouring resort Ibiza. 3. Tenerife (Flight time: 5 hours): Tenerife has a resort for everyone. While Costa Adeje is a safe bet for family fun, Playa del Americas is all about partying till early morning. For Instagram-worthy selfies on tranquil beaches, Las Terasitas is where you should be. • Car parking at the airport comes in a range of options: long stay, short stay, fast track and pick up, with fees from £2 onwards. • Spend some relaxing time before flying off at the Upperdeck Lounge (charge: £21) that provides complimentary Wi-Fi, snacks, drinks and charging stations. • For a faster check-in, buy the Priority Security Pass for £4.99 and skip queues. • Glasgow Airport has a number of high-street brand stores such as Swarovski, Jo Malone and Victoria’s Secret. For travel essentials, drop in at Boots or Tesco. • If you crave for some munching before boarding, there are plenty of options such as Starbucks, Deli Kitchen Cafe, Frankie & Benny’s and many more. • The airport offers an unsupervised play area for kids aged 2-6 years as well as baby changing areas around the terminal.